William Beck "Swish" Nicholson (December 11, 1914 – March 8, 1996) was a right fielder in Major League Baseball who played for the Philadelphia Athletics (1936), Chicago Cubs (1939–1948) and Philadelphia Phillies (1949–1953). A native of Chestertown, Maryland, where he attended Washington College, he batted left-handed and threw right-handed. In 1944, Nicholson received an intentional walk with the bases loaded. He is listed as one of only six players in major league history to do it. The others are Abner Dalrymple (1881), Nap Lajoie (1901), Del Bissonette (1928), Barry Bonds (1998) and Josh Hamilton (2008). In a 16-year career, Nicholson posted a .268 batting average with 235 home runs and 948 RBI in 1677 games. Nicknamed "Swish" because of his mighty swing, which often missed the ball, Nicholson twice led the National League in home runs and RBI. He played briefly in the American League for the Philadelphia Athletics in 1936, then spent two years in the minors before joining the Chicago Cubs in 1939. Nicholson became a regular with the Cubs in 1940. His most productive season came in 1943, when he hit .309 with a league-leading 29 home runs and 128 RBI. He finished 3rd in the NL MVP Award vote behind Stan Musial and Walker Cooper. In 1944, Nicholson slipped to .287, but he again led the NL in home runs (33), RBI (122) and runs (116). In the same season, after hitting four consecutive homers in a July 23 doubleheader at the Polo Grounds, he came to bat with the bases loaded in the eighth inning of the second game, and was intentionally walked. Obviously, that forced in a run, but the Cubs couldn't score again and the Giants won the game, 12–10. This time, he lost the MVP honors by one vote to Marty Marion. Although Nicholson helped the Cubs to the 1945 pennant, his failing eyesight resulted in a slip in production. He hit only .243 with 13 home runs and 88 RBI in the regular season, and batted just .214 with eight RBI in Chicago's seven-game loss to the Detroit Tigers in the World Series. 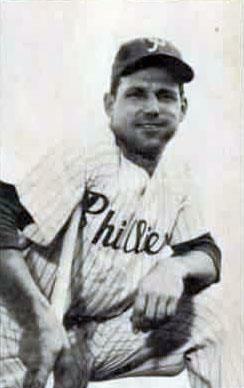 In 1949, Nicholson was traded to the Philadelphia Phillies, where he became a part-time player and frequent pinch-hitter. The next season, after he became weak and lost weight, it was disclosed that Nicholson was diabetic. He was unable to play in the World Series with his "Whiz Kids" teammates against the Yankees. Well respected as one of the toughest men to double up, Nicholson hit into double plays only once every 90.7 at-bats. He finished his career in 1953 with eight pinch homers. Bill Nicholson died in Chestertown, Maryland, at age of 81. One of five NL right fielders to register 11 total chances in a game (1945). The others are Harry Schafer (1877), Greasy Neale (1920), Casey Stengel (1920) and Bake McBride (1978). The major league record is held by Tony Armas, who handled 12 chances in an AL game (1982).